Beautiful bach located on Wintle Street. 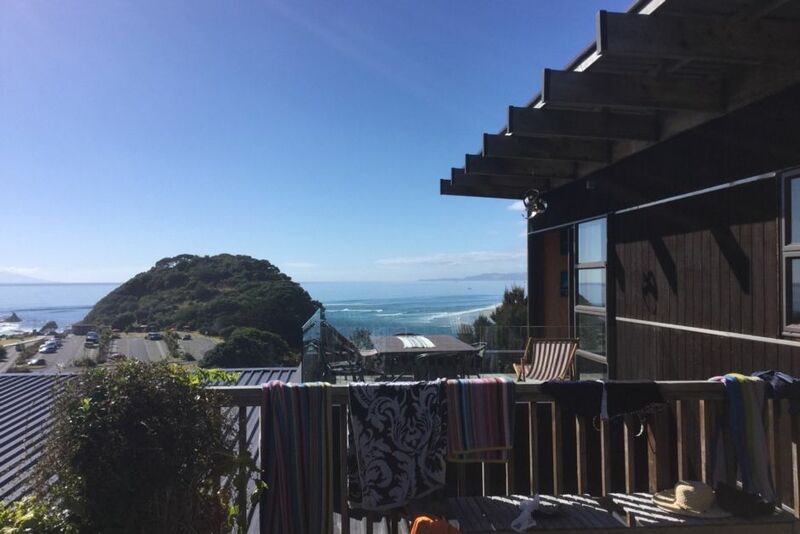 1/2 minute walk to the estuary and surf beach. Beautiful panoramic views of surf beach, and estuary. 20 minute walk or 2 minute drive to local shops and cafes. Two spacious decks which make the most of the sun and views. Bathroom with bath and toilet, plus seperate toilet and an outdoor shower. There are quite a few stairs up to the bach and an internal staircase which means it is not suitable for toddlers. During xmas/new year period(most of January) a minimum of one weeks rental required. At other times a minimum of two nights per stay. Not suitable for parties as this is an upstairs apartment. this bach has all the amenities you need for a wonderful holiday, so close to the beach that you dont need to worry about parking, you can just walk to it, 2 mins away. If you don't feel like walking to the beach the views are amazing and will keep you entertained all day. modern well equipped kitchen. Lovely large nook to sit and read and gaze out to the view. So close to the surf beach that you do not need to worry about finding a car park.